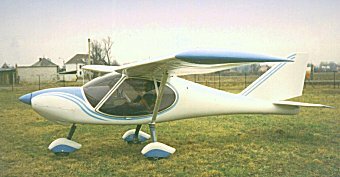 This aeroplane originally surprised by its unusual design with deflecting wings without ailerons and by its attractive look. This conception has led to interesting strength schema of wing with a tubular GFRP spar transferring both torsional and bending forces of the wing. The foam ribs has been pushed in their place on the spar.